Kopi Kade will screen its 1,350th episode tomorrow night. The story revolves around taking loans not to make ends meet, but to be fashionable like the rich, and being unable to pay back the loans. Script writer Thilak Kumara Ratnayake told the Daily News that Kopi Kade not only aims to entertain viewers, but also drive a message among them. Ratnayake said Kopi Kade was first directed by Andrew Jayamanne and captured the hearts of all Sri Lankans. He said Kopi Kade artistes took to the streets to collect funds and assistance to help the people displaced by the war and other natural calamities, which was followed by the others. Kopi Kade artistes Martin Gunadasa (Poli Mudalali), Wimal Wickremaarachhi (Ratne), Denawaka Hamine and Raja Sumanapala are not among the living while some had left, Ratnayake said. 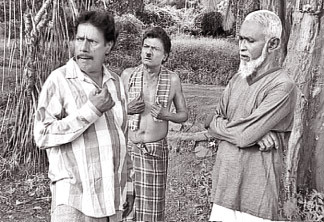 He said stars like K D Siripala and Ariyaratne Handuwela, including him, continue to play their assigned roles for the past 27 years beginning from the first episode telecast on April 1,1987. Ratnayake said Kopi Kade was started as an experiment, to see how best a production could be made utilising minimum funds. "We have proved very successful and our tele drama became one of the strong sources of income to Independent Television Network (ITN)," he said. Senior Minister DEW Gunasekera, as ITN chairman once said that Kopi Kade was the station's live wire. "Kopi Kade will be screened as long as viewers will want it to continue," Ratnayake said.